This resource is great for encouraging students to engage in MEANINGFUL science discussions. The sentence starters can be used before, during or after activities such as labs, videos, discussions, readings, etc. 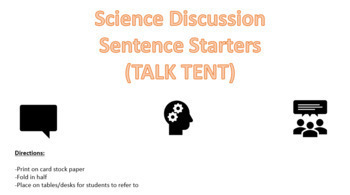 With the new science standards in place (NGSS), students need to analyze tables/charts, discuss their ideas and develop their own investigations and these sentence starters will help students develop those skills. The "Talk Tents" can stay on the desks/tables and students refer to them as needed or when asked to use them. You simply print on card stock and fold in half to make a tent. If you like them please leave feedback or a rating! It is greatly appreciated.